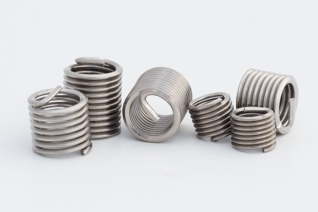 Helicoil inserts are precision formed screw thread coils worked into a diamond shape. The resultant surface finish is a mirror-like 8-16 micro inches. This wire is then wound into a spiral coil which when installed into Helicoil tapped holes, provides permanent conventional 60º internal screw threads. Copyright © 2019 Rivetwise. All Rights Reserved.